What happens when small farmers in Guatemala save seeds from one year to the next, as they have for centuries? They get up to four years in prison. 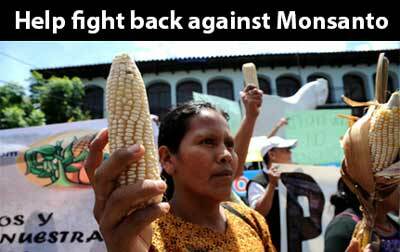 That's according to the "Monsanto Law," which was recently struck down by Guatemala's highest court. But now Monsanto is saying the law is required under free trade deals, and it's likely only a matter of time before it launches a wave of lawsuits to force Guatemala to give in. Developing nations like Guatemala have no chance against a corporate superpower like Monsanto -- that's why we're standing with Guatemala and fighting to stop the expansion of trade deals that allow this kind of bullying. Can you chip in $1 to help stand up to Monsanto? Yes, I'll chip in $1 to help Guatemala and other developing nations stand up to Monsanto's bullying. For centuries, farmers have saved seeds from one year to the next. But Monsanto now claims that seeds are its intellectual property -- and it will use trade deals to force countries like Guatemala to give in no matter what their courts say about it. This is a classic example of how Monsanto and other multinational corporations use trade agreements to bully sovereign governments -- and as we speak, it's pushing for new trade deals like the TTIP and the TPP, which would expand its powers to stampede over the rights of people even more. That's where we come in. SumOfUs was created to leverage the global consumer power of our 5 million members to take on multinational corporations that have gotten too big for any of us to take on alone. Can you chip in $1 to help stand up to Monsanto and its anti-democratic trade deals?